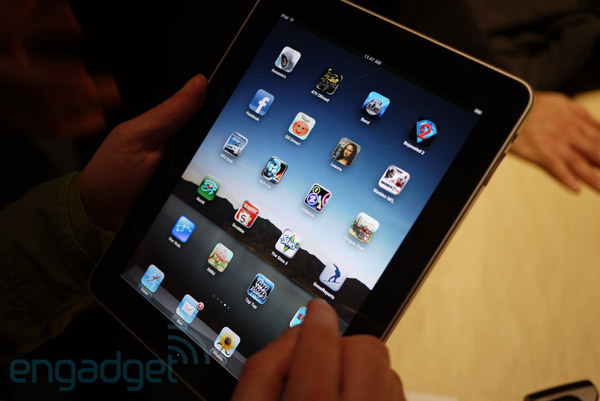 By now you've probably read more on Apple's iPad then you ever dreamed possible. In the last few days we've covered a lot of angles on the tablet and compiled a lot of data. Still, we felt that we hadn't given you clear hands-on impressions and collected the myriad details about the device in one, easy-to-reach place. So we've decided to bundle all of that info into a single feature, joining our first-hand encounters with the iPad together with all of the data and details you should be aware of -- including specs, plans, release schedules, pics, and video. 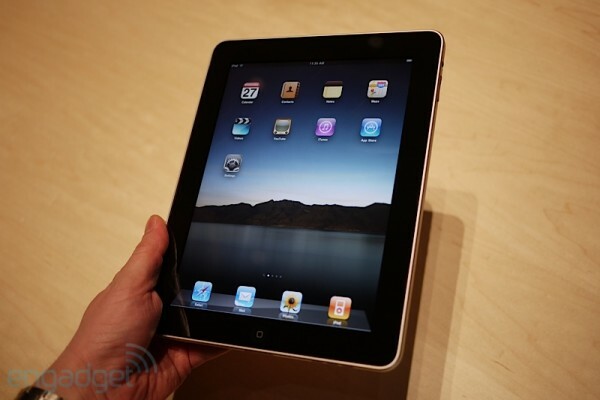 So read on for everything we know (so far) about Cupertino's first tablet! The iPad is a beast of a machine, so here's a rundown of what makes up Apple's latest and greatest. 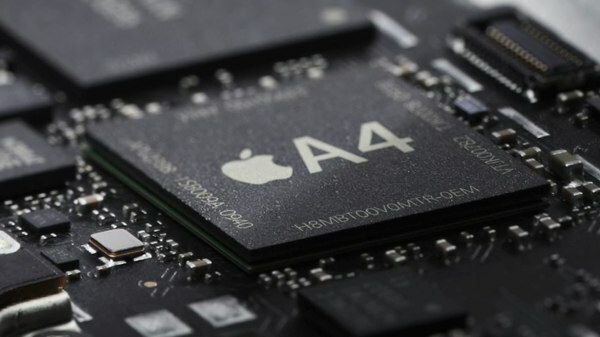 CPU: Apple's custom 1GHz A4 SOC, manufactured by Samsung. And we can tell you, it's blazingly fast. Display: 9.7-inch, 1024 x 786 (132 PPI), LED backlit IPS with capacitive touch and oleophobic coating. Storage: The iPad will come in 16GB, 32GB, and 64GB variations. RAM: No word on this from Apple (just like with the iPhone and iPod touch). We assume it's more than the iPhone 3GS's 256MB, but we won't know for sure till we see a full breakdown. Wireless: The devices comes standard with 802.11a/b/g/n WiFi and Bluetooth 2.1. You can also purchase a version which has 3G connectivity (UMTS / HSDPA 850, 1900, 2100MHz and GSM / EDGE 850, 900, 1800, 1900MHz). Sorry everyone, AT&T only here in the US -- and if you're thinking about using your iPhone SIM, think again. 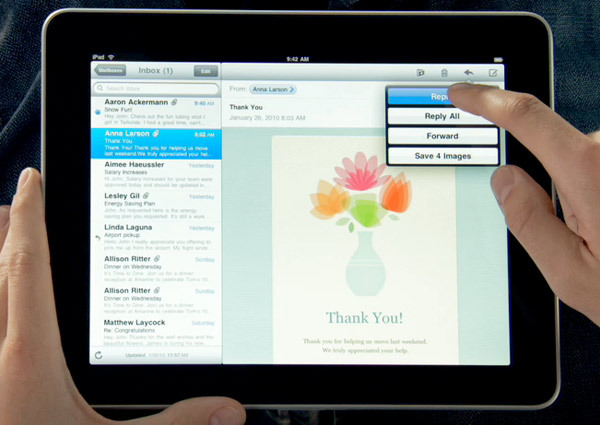 The iPad uses new micro SIMs. Other sensors: The iPad has a digital compass, there's AGPS on-board in the 3G version, and both versions have an accelerometer and ambient light sensor. Ports / input / output: Headphone jack, 30-pin dock connector, built-in microphone, built-in speaker. Battery life: Apple claims "up to" 10 hours web surfing on WiFi, listening to music, or watching video, and over a month on standby. Dimensions: height: 9.56-inches, width: 7.47-inches, depth: 0.5-inches, weight: 1.5 pounds (1.6 for the 3G model). In case you can't tell by looking at the thing, the iPad does -- indeed -- resemble a large iPhone (actually, more like an iPod touch). The front of the device is a large, smooth piece of glass with no buttons save for the familiar "home" button in a bottom center location. The 9.7-inch display is surrounded by thick black bezel. Around back the look is familiar as well, something of a cross between the back of a 3GS and a MacBook Air -- smooth aluminum which slightly curves and tapers along the sides. On the top of the iPad there's a power / sleep button on the right and a headphone jack on the left, while along the right side you've got a volume rocker and sound kill switch. On the bottom of the pad is a 30-pin dock connector jack and speaker vents. 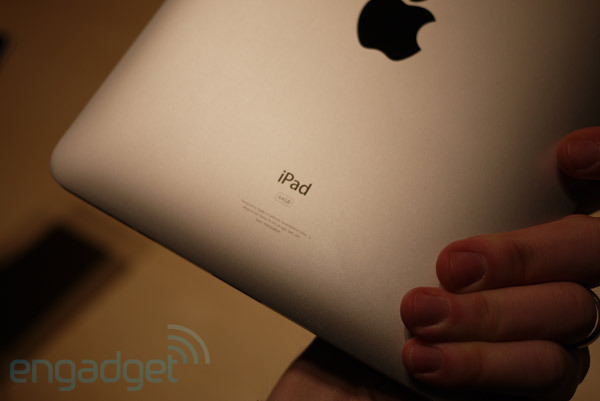 In your hands, you can definitely feel the 1.5 pounds of weight the iPad carries. It's not super heavy, but it has a healthy solidness to it. The aluminum is welcoming to touch and hold, though the glass (as you would imagine) is a magnet for smudges. Just expect to be wiping this thing clean a lot. One handed operation is definitely the name of the game for the iPad unless you're sitting, so expect to be holding it with one hand while navigating with the other. When you're seated, it's clear Apple has two use cases in mind: on the lap, or on a table. Both work easily enough, though it's going to take some getting used to when it comes to typing. The iPad is running a modified version of the iPhone OS (3.2 at this point), which has some new user interface additions (and allows apps to be coded for that bigger screen). The biggest changes to the software come in the form of new contextual drop-down menus in applications, split screen app display (as we saw in the mail application), and modal pop-overs (little windows that snap up over your current work area -- as seen in the iTunes store). Specific changes to applications are abundant, as pretty much every installed app has been upgraded and recoded for the larger screen, including mail, calendar, Mobile Safari, the iTunes and App Stores, photos, YouTube, and more. There are also two new apps: iBooks, an e-reader application, and its accompanying store, which lets you download books right to the device. The store interfaces are much more robust than their iPhone counterparts, now feeling more closely related to the desktop versions. Interestingly, Apple didn't include its stock or weather applications on the demo units we saw, and they're not present on the official site. There's no phone or SMS functionality on this device, and no iChat, though the iPad can run "almost" (Steve's words) all of the 140,000 apps made for the iPhone and iPod touch. It does this in two ways; the first is by running a regular sized version of the app in the center of the screen, and the second way is by scaling up the application so it fills the screen. The effect looks good on games, though seems a little silly on applications such as Facebook. 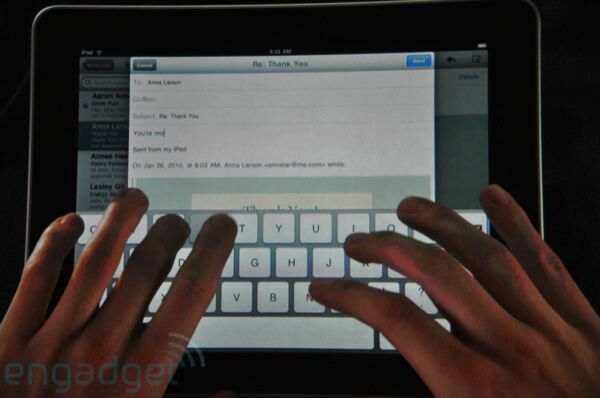 The iPad has a new keyboard that spans the length of the device (both in landscape and portrait) which looks similar to a standard QWERTY keyboard, and it also has a number of contextual keyboards which pop up for different uses (such as a data entry, where you want a numeric keypad). If you're wondering about notifications, we have yet to see how they work. Whether or not they'll be pop-ups as on the iPhone remains to be seen. Other non-changes include multitasking, meaning... multitasking is also out as of now. You can only run one app at a time here (though like the iPhone, we assume Apple will make allowances for iPod functionality, Safari, and mail). The company showed off a few early third-party demos at the launch event, including games from Gameloft and EA, and a new version of the popular Brushes application which is currently available on the iPhone. The New York Times was also on hand to show its native application for the device, which boasts a number of features specifically catered to the iPad's screen real estate. 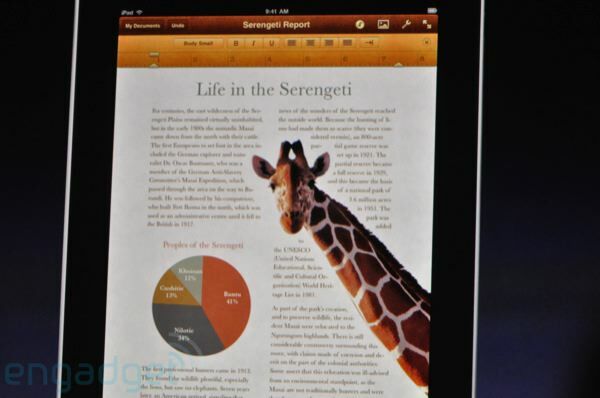 Apple also demonstrated its new iPad-specific suite of iWork apps, including Pages, Numbers, and Keynote. All were rebuilt entirely for use on this device, and will be available at launch for $9.99 apiece. If you're thinking that using the iPad is a lot like getting around on an iPhone, you're dead right -- and that's by design. Apple clearly wants users to have a painless transition from their smaller devices to this -- Steve even said as much during the launch. The experience is almost identical, save for a few places where Apple has extended or tweaked functionality to utilize the expansive screen space. In general, getting around is what you expect -- lots of icons in a grid on the homescreens. No widgets here, no extra data, no real additions at a glance. Moving into and out of apps is the same single press experience. Even the lock screen is identical (though it does include a button for starting up a slideshow of pics -- yay!). It's the apps that are really different. For instance, in mail you now have a view of your message list and your current email in one look -- if you switch to portrait, you get just a message view with a drop down menu for your list. The calendar app is completely different, coming off more like a date book than just a grid of days or list. We didn't get a lot of time to play with it, but it looks far more robust than its iPhone counterpart. Apple's new ebook app -- iBooks -- is one of the more visually impressive pieces of software on the device, giving you handsomely animated page turns, along with display settings and search functionally accessible through a contextual menu. The iBooks app also uses a handsome (though awfully familiar) bookshelf motif which allows you to navigate your collection. As we said before, the Store apps now share more functionality with their desktop big brothers. When you're looking at music or apps, you can call up a pop-over display that gives you a snapshot of info. It's a great UI change that we hope makes it to some iPhone apps. Instead of the common in-one-screen-out-to-another use that you're familiar with, this provides a much more contextual and speedy solution. 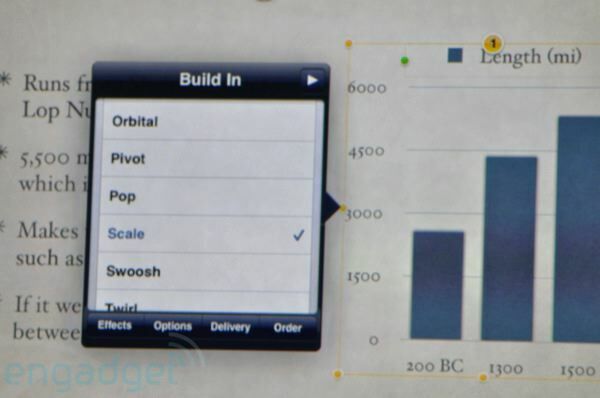 Similarly, many apps involve top-and-hold functions to access deeper functionality -- akin to a contextual right click. Applications like Safari and maps utilize the previously mentioned drop-down menus, but also take advantage of Apple's pinch zooming functionality. Obviously getting around in these two applications will feel very familiar, but it should be noted that Apple hasn't really added any additional gestures, such as being able to rotate the map you're looking at (something we've seen on the Surface, and seems to make sense here). Safari works just as you'd expect it, even the tabs are handled with separate "cards," though it does add drop-downs for the bookmarks and share options. Oh, and another thing about Safari -- there's still no Flash support here, so if you were expecting to enjoy your favorite NBC programs or watch HD Vimeo content while lounging around your apartment, you're out of luck. Typing on the iPad can be a little difficult. Holding it in your lap is fairly easy, but as you can see in our video up above, when it's flat on its back on a table, it tends to move around a bit given that it's curved. If you're holding the device in portrait mode, it's possible (though not that easy) to type with your thumbs, but you're more likely to be hunting and pecking with a single hand (unless you have some large paws). Luckily, when it comes to holding it, Apple provides that large bezel around the side, so you're not actually touching the screen when you're gripping it. If you're interested in handwriting recognition or stylus input -- you're out of luck. From what we can tell there's no handwriting recognition here besides the Asian character input, and Apple certainly isn't selling a stylus accessory for this device. 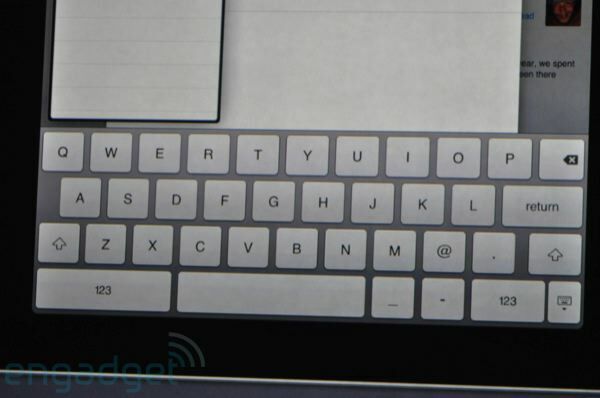 The company seems to be sure that the way to go with the iPad is keyboard-only input. Hell, they'll even sell you an external keyboard! Overall, this isn't a sea-change experience. If you know the iPhone and iPod touch, you know this device... and that's how Apple wants it. However, we're not ruling out the possibility that between now and the launch date Apple won't include some new functionality with this thing -- as said earlier, the weather and stock apps are conspicuously missing, which gives rise to the possibility that Apple may have a widget concept in mind here. We're hoping the company decides to expand on some of this at least -- particularly when it comes to running more than one app at a time, because we don't think the use cases shown off are super compelling for most users at this point. 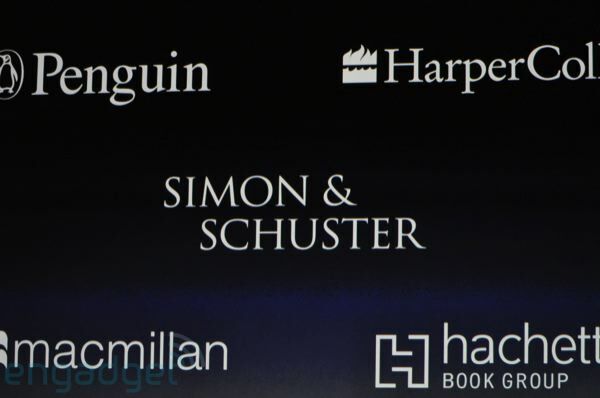 Besides the standard music and video partnerships Apple already has for its stores (and those aren't changing yet), the company has teamed up with give publishing houses to start bringing ebooks to the iPad: Macmillan, Penguin, HarperCollins, Simon & Schuster, and Hachett. We don't think that's going to equal the number of titles you can get on a Kindle or Nook (not by a long shot), but we do think the iPad will be a magnet for publishers -- more partners are sure to follow. The WiFi-only iPad won't hit shelves until April 3rd (a Saturday), and the 3G version is slated to come to market in "late April." Pre-orders for both versions started on March 12th. As previously mentioned, there will be three tiers of storage. Additionally, Apple has worked out a data-only deal with the dreaded AT&T to provide 3G support to this device (there were literally boos and deep breaths taken when this was announced). Apple is offering what it calls "breakthrough" prices on two pay-as-you-go tiers; a $14.99-a-month plan that nabs you 250MB of data, and a $29.99-a-month option which gives you unlimited access. The devices come SIM-unlocked, but they only accept the not-widely-adopted micro SIM chips, thus halting your ability to throw any old SIM you want in there. Shipping: From what we can tell, there are all sorts of iPads already in the US, but Apple and UPS are doing some fudging around with what they're telling us package tracking-wise. Orders that were hours ago listed as residing in Kentucky are now just saying that they've been scanned in Shenzhen. Either way, if you have a scheduled Saturday delivery, we're guessing you're getting an iPad on Saturday. Pickup: If you chose the Apple Store pick-up option for your pre-order, there's much less confusion: just walk into your chosen Apple Store at 9AM and grab one. Only thing you have to remember is to get there before 3PM, or you'll lose your hold on a unit and it will be sold on a first-come first-served basis. So, you didn't pre-order? Well, you're not totally out of luck. All of Apple's Apple Stores are slated to carry iPad stock outside of pre-ordered units. We're guessing lines should be a fraction of iPhone 3G insanity, but will undoubtedly still form in choice locations -- out of force of habit, if anything. There's no word on how much stock there will be up for grabs at each store, but we'd say at least in the order of hundreds at the bigger flagship locations. Stores will be opening for everybody at 9AM, but we're guessing pre-order folks will get in first to nab their iPads -- they'll at least have a separate line for pickups until 3PM. After 3PM you might get another shot at buying an iPad if your store runs out of unassigned iPads early on but somebody didn't manage to pick up their pre-order in time. Meanwhile, some Best Buy stores will also be getting iPads. If your Best Buy has a dedicated Apple section within it, chances are it will be getting some quantity of iPads, but we'd call ahead just to be sure. It's a gamble: Best Buys will have much less attention line-wise, but also we're guessing they'll have dramatically less iPad stock, so play your line-waiting cards wisely. 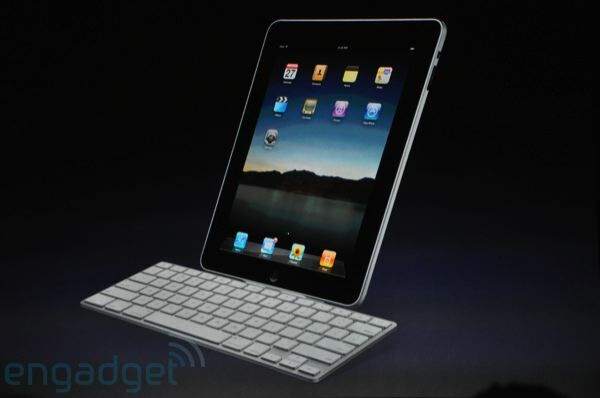 Apple also announced four accessories for the iPad. A $29 dock / stand, a $39 case, a strange camera connection kit at $29, and most surprising of all: a $69 dock with an attached physical keyboard. The last one strikes us as odd given Apple's insistence that its virtual keyboard technology is superior just about anything else you can put your hands on. It's also bizarre considering the iPad's portability. We can't see ourselves plunking this thing down for heavy sessions with this dock, but we suppose there are users who will want it. The camera connection kit and keyboard dock are slated to ship "late April," just like those 3G iPads, Apple's iPad case is at "mid April," and the basic iPad dock / dock connector to VGA adapter will both hit April 3rd. 10W USB power adapter? Not until May. What's unclear is which of these, if any, will be available at retail Apple Stores at launch. We'd assume the Dock and Dock Connector will make the cut, but with the general populace's love of buying cases when they pick up iPhones, it would seem a little silly for Apple not to have the iPad Case in stock on launch day. We suppose we'll find out soon enough. As with any unreleased device, we're not at the reviewing stage just yet (not even close!). We only spent a small amount of time with the device, and we're not nearly ready to draw any final conclusions about this thing. There is clearly huge potential for the iPad, but Apple has also made some glaring omissions with the software (and at least one with the hardware). The lack of multitasking, and the unimaginative use of all that screen real estate within the OS is disappointing and raises questions about how useful this will be as a stand in for something like a netbook (a comparison Jobs was happy to make). Overall, while the UI changes are nice and clearly the iPhone OS scales well, there seems to be a lack of maturity and imagination in the OS -- one that could make lots of users question the device's utility. On the hardware front, the missed opportunity of a webcam for things like video calls seems like a real hit here -- what better way to speak face-to-face with someone than with a device like this in your hands? Those issues aside, the combination of beautiful hardware and elegant software is undeniable, and what Apple may have lacked in imagination, the legion of iPhone developers certainly will not. The possibilities for this device are huge, and we have no doubt that devs around the globe will take full advantage of that -- just as they have on the iPhone and iPod touch. We also won't rule out the possibility that Apple itself isn't done tinkering here; there could very well be surprises lying in store for us before that launch date arrives. A two month window is no small matter. Regardless, it's clear that Apple has taken the ball and is running with it when it comes to touch based computing -- the only question is whether they can barrel this thing into the endzone.